1) AV and room assistance or set up (AV instructions will be provided). 2) Providing any signage or copies necessary for your meeting. We do not provide signage or copies. Center Copy West is located directly down the hall across the lobby if you are in need of these services. 3) Any food you'd like to bring on-site. We do not provide coffee, microwave, or any kitchen access. There is a drinking fountain located outside the office near the restrooms. We encourage guests to provide their own catering. Please note that large groups may be requested to remove their trash. 4) Our conference room phone. You are welcome to use our phone if needed; however you and your group will be held responsible for any damage done to our phone. We are a working office, and we request that our guests be respectful of that fact by managing their volume and respecting our "Arc Staff Only Beyond This Point" signage. We are not able to provide onsite staff support for meetings. Below you will find room information and requirements for use. Room Requests. At least 24-hours’ notice must be provided when requesting a room. Room requests are not guaranteed. You may request a room here. Dates requested must be within 60 days of the date you are making the request. Key Card Access. No key card is required to access The Arc’s office during regular business hours. A key card is required to access the building at any time other than 6:00 am – 6:00 pm M-F and Saturdays after noon. The same key card is required to enter the suite. Key cards must be signed for by the responsible party and returned to an Arc staff member. Key cards must be in the possession of the Responsible Party when using the space, meaning whoever is given the key must be present throughout the event. Restrooms. There is a restroom close to the suite; however, an accessible restroom is located on the other side of the lobby. Anyone using either restroom will need to take the key card with them to re-enter the meeting space. After Hours Use. The Arc may charge $25/hour for HVAC services for use of our space during off-hours. This charge is a direct offset to costs incurred by The Arc to run HVAC. Original Condition. Any group using the space must leave it in its original condition. The Arc will charge the responsible party for the repair or replacement of any of the equipment, furnishings, finish, etc. damaged during the space’s use. Tables will need to be wiped down before party leaves (wipes will be provided). *This includes the thermometer - please return to a reasonable setting (above 65) before you leave. Doors, Lights and Equipment. Please turn off all lights and A/V equipment when leaving. Please make sure the door is shut and locked behind you. Also please note that the doors on the Arc office side (both the one attached to the large meeting room and the one accessible from the hallway) are NOT to be accessed by groups using the room. Legal and Approved Use. The Arc prohibits the use of its space for any illegal activities. In addition, the use of alcohol and/or marijuana is prohibited on the premises. The space may also not be used to support activities which conflict with the Mission, Vision or Values of The Arc – Jefferson, Clear Creek & Gilpin Counties. The Arc reserves the right to refuse use of our space to any group at its discretion. Weapon-Free Workplace Policy. 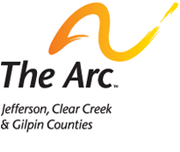 To ensure that The Arc – Jefferson, Clear Creek & Gilpin Counties maintains a workplace safe and free of violence for all employees and guests, the company prohibits the possession or use of dangerous weapons on company property. Click here to submit a request for room usage.